This is the first game in the Hokuto no Ken series. For other games in the series see the Hokuto no Ken category. Black Belt is a 1986 beat 'em up game released for the Sega Master System. It is a localization of the Japanese Mark III game, Hokuto no Ken (北斗の拳, Hokuto no Ken? ), based on the manga and anime series of the same name (Fist of the North Star in English). The international version was stripped of the Hokuto no Ken license, forcing graphic alterations to the game. 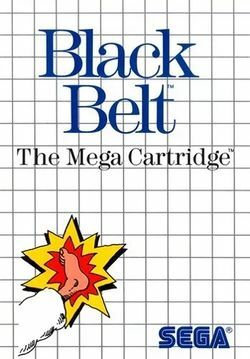 Black Belt was one of programmer Yuji Naka's early games prior to his involvement in Sonic the Hedgehog. The game was changed when it was brought over from Japan. The changes were the characters themselves and the backgrounds, as well as everything related to the property. However, the game mechanics are still the same and even the lesser enemies die by exploding into bits. A sequel was released for the Sega Mega Drive in Japan, which was released internationally as Last Battle, once again stripped of the Hokuto no Ken license. This game is officially the first game to bear the Hokuto no Ken title. It was followed by another Hokuto no Ken game released for the Famicom. The Sega Mark III version was released in Japan on the Wii Virtual Console in 2008, and was also included as an unlockable in the Yakuza and Hokuto no Ken crossover Fist of the North Star: Lost Paradise, released in 2018. The player take control of a martial artist named Riki, who sets out to rescue his girlfriend Kyoko from his rival, Wang. The game is composed of six left-to-right side-scrolling stages in which Riki faces different types of underlings (depending on the stage), facing occasional sub-bosses at mid-points of certain stages. At the end of each stage, Riki must confront the stage's boss, each being susceptible to only one type of attack. The player must exploit their opponent's weakness and use it to finish the boss off. Many of the bosses can be beaten by repeatedly pressing the kick button, but some of the bosses must be attacked in a specific way to be defeated. This page was last edited on 16 December 2018, at 07:26.